Our application includes tutorials: 0. SCM - Home 1. 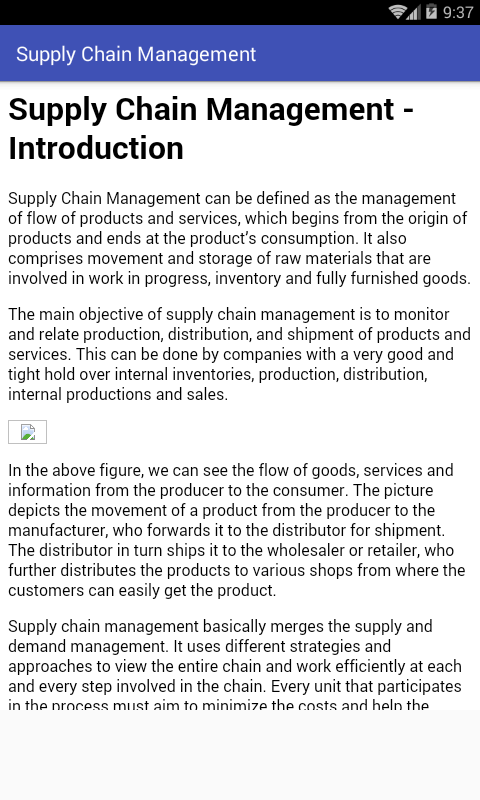 SCM -Introduction 2. SCM - Process 3. SCM - Process Flow 4. SCM - FlowComponents 5. SCM - Decision Phases 6. SCM - Performance Measures7. SCM - Strategic Sourcing 8. SCM - Make Vs Buy 9. SCM - Networks10. SCM - Inventory Management 11. SCM - Pricing and Revenue 12.SCM - Integration 13. SCM - Role of IT 14. SCM - Agile and ReverseSupply Chains 15. SCM - Quick Guide 16. SCM - Useful Resources 17.SCM - DiscussionThanks for reading the tutorial. Our application includes tutorials: 0. Retail Management - Home 1.Retailing - Overview 2. Retail Management - Sectors 3. RetailChallenges and Theories 4. Understanding Retail Consumer 5. MarketSegmentation and Strategies 6. Retail - Business Location 7.Merchandise Management 8. Retail - Business Operations 9. RetailManagement - Space 10. Retail Management - Pricing 11. RetailManagement - Marketing 12. Emerging Trends In Retail 13. RetailManagement - Quick Guide 14. Retail Management - Resources 15.Retail Management - DiscussionThanks for reading the tutorial. Our application includes tutorials: 0. Organizational Behavior-Home 1. OB - Introduction 2. OB - Determinants 3. OB - Concepts4.OB - Scope 5. OB - Functions of a Manager 6. OB - Models 7. OB-Learning 8. OB - Personality 9. OB - Theories of Personality 10.OB- Perception 11. OB - Motivation 12. OB - Theory X and Theory Y13.OB - Groups in Organization 14. OB - Group Decision Making 15.OB -Leadership 16. OB - Theories of Leadership 17. OB -ConflictManagement 18. OB - Culture 19. OB - Change 20. OB -Development21. OB - Quick Guide 22. OB - Useful Resources 23.OrganizationalBehavior - DiscussionThanks for reading the tutorial. Our application includes tutorials: 0. Marketing Management -Home1. Marketing Management - Overview 2. Marketing Management-Concepts 3. Marketing Management - Process 4. MarketingManagement- Functions 5. Marketing Mngmt - Environment 6. Porter’sFiveForces 7. Marketing Management - Planning 8. MarketingManagement -Research 9. Research Process 10. Consumer Behavior 11.MarketingManagement - OBB 12. Marketing Mngmt - Segmentation 13.DemandForecasting 14. Product Life Cycle 15. Branding of a Product16.Marketing Mngmt - Brand Equity 17. Marketing Mngmt -PricingDecision 18. Promotion Decisions 19. Distribution Channels20.Physical Distribution 21. Marketing Mngmt - Advanced Topics22.Marketing Mngmt - Quick Guide 23. Marketing Mngmt - Resources24.Marketing Mngmt - DiscussionThanks for reading the tutorial. Our application includes tutorials: 0. Recruitment and Selection-Home 1. Introduction 2. What is Recruitment? 3. FactorsAffectingRecruitment 4. Recruitment Process 5. Types of Recruitment6.Recruitment Interviews 7. Types of Interviews 8. What isSelection?9. Salary Negotiations 10. Making a Job Offer 11. QuickGuide 12.Useful Resources 13. DiscussionThanks for reading thetutorial. Our application includes tutorials: 0. Home 1. Introduction 2.Legalvs. Ethical 3. Ethics For Employees 4. Ethics For Employers5.Ethics In Profession 6. Rights of an Employee 7.WhistleblowerPolicy 8. Professional Ethics - Quick Guide 9.Professional Ethics- Resources 10. Professional Ethics -DiscussionThanks for readingthe tutorial. Our application includes tutorials: 0. Shop Floor Mngmt - Home1.Shop Floor Mngmt - Introduction 2. Types of Productions 3.ShopFloor Mngmt - Layout 4. Shop Floor Mngmt - Process Flow 5.ShopFloor Mngmt - Setup 6. Shop Floor Mngmt - Control 7. ShopFloorMngmt - Communication 8. Shop Floor Mngmt - Organization 9.ShopFloor Mngmt - Safety 10. IT and Automation 11. Shop Floor Mngmt-Quick Guide 12. Shop Floor Mngmt - Resources 13. Shop Floor Mngmt-DiscussionThanks for reading the tutorial. Our application includes tutorials: 0. Performance Management -Home1. Performance Mngmt - Introduction 2. Performance Management- Aims3. Characteristics 4. Performance Mngmt - Concerns 5.UnderstandingPerformance 6. Guiding Principles 7. PerformanceManagement -Process 8. Planning and Agreements 9. ObjectiveSetting 10. Measuresand Assessments 11. Managing Performance 12.Reviewing Performance13. Performance Review Skills 14. EvaluatingPerformance Reviews 15.Assessing Performance 16. ImprovingPerformance 17. Improving TeamPerformance 18. Improving IndividualPerformance 19. ManagingUnderperformers 20. Performance Management- Forms 21. Managementand Learning 22. Coaching 23. PerformanceMngmt - Quick Guide 24.Performance Mngmt - Resources 25.Performance Mngmt -DiscussionThanks for reading the tutorial. We make organizing every type of sport or group activity easy –covering every sport you can imagine from track & field,tennis, swimming, cheer, soccer and hockey – to baseball,basketball, softball, football, lacrosse and more. Plus, we supportactivities from scouts, e-sports, theatre and book club – to familymanagement, chess, math league and more. How can TeamSnap help you?- View team roster and participant information anytime, anywhere. -Create schedules and easily sync personal and team calendars. -Track who’s coming to each event, meeting, practice or game withmember availability. - Chat with the team, send last-minute alertsor send messages to custom groups. - Send invoices, collect paymentand track everything right from the app. - Receive real-time gameupdates and video highlights with TeamSnap Live! - Managevolunteers, sign-ups, carpools, lineup creation and more. -Securely store and easily share photos, files and documents. How toget started with our Android app in 4 easy steps: 1. DownloadTeamSnap and create your account. 2. Complete your roster byinviting all participants (encourage them to accept their TeamSnapemail invitation!). 3. Schedule your first event and synccalendars. 4. Make sure members mark their availability so you knowwho’s attending the events. How much does TeamSnap cost? TeamSnap’sAndroid app is totally free to download from the Google Play Store.First-time team owners – install the app and immediately enjoy 21days completely free to test drive all the premium features. Nocredit card required. After the trial – pick the plan that’s rightfor you, including our free plan with limited features and rosterlimits. Visit https://www.teamsnap.com/pricing/teams to learn moreabout our free and paid plans. TeamSnap is always free for themembers on your team regardless of the plan you select. We hope youenjoy spending more time “playing” and less time organizing withTeamSnap. Heja - The only app you need to easily handle your sports team'scommunication between coaches, managers, parents and players. "Sohappy to have found this app! Easy to use, great design, no ads, nononsense and the parents really like it too!" "This app is awesome.Glad we set it up" "Just downloaded the app and it's amazing. It'sreally going to organize our team and show who the uninterestedpeople are." Forget the clutter of email, social media, documents,texts and phone calls... Heja makes it easier to send, receive andconfirm everything about the team all in one place! 100% free • Noads • Private & Secure • Easy to use • SCHEDULING – Everythingabout games and practices in one place, with automatic reminders toparents and players. • AVAILABILITY & RSVP – Keep updated onwho’s attending games and practices, and when and why someonecan’t. Heja even reminds everyone to reply. • ROSTER – Contactdetails for everyone on the team. • MESSAGING – Send messages toindividual team members, groups or the entire team. • PHOTO SHARING– A safe and easy way to share photos with everyone that didn’tmake it to the game. • PARENTS – No other app makes it as easy asHeja to be a parent in a sports team. Every feature is made to makesure that information reaches the right person. • MULTIPLE TEAMS –Heja makes it easy for parents with kids on multiple teams, withall team info in one place. Plus a whole lot more. 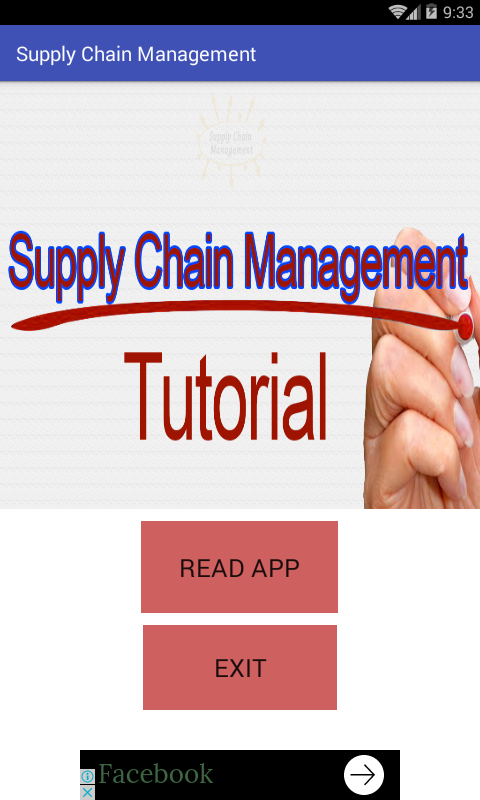 Monitor and manage your supply chain on the GT Nexus mobileapplication. Access orders and invoices for an update on yourpipeline of products, and access shipments for an update on thelocation of your products in motion. With the GT Nexus mobile app,information regarding your global supply chain is always an arm'slength away allowing you to make quick and informed decisions whenthe need arises. Stay In-Touch - Connect with your existing GTNexus user login. - Pick up where you left off with quick access toyour recently viewed items. - View tasks & re-assign toteammates. Extend Your Awareness - Roam free from your desk whileviewing critical orders, invoices, shipments, shipping orders andpacking lists. - View attached documentation and share new uploadswith your trading partners. - Stay on top of shipment statusupdates & important milestones. - Task-based design foron-the-go use. Security - Mobile E-ID: Use the app as an accesscode generator when you are required to log in using two-factorauthentication. - Single Sign-On Support: Sign in using thecredentials you have set up with your organization's SSO provider.- Log in swiftly and securely with fingerprint authentication.Bonus - Stay on top of supply chain trends, industry hot topics,and best practices with GT Nexus podcasts. InstaTeam is a complete team management app with mobile-firstdesign used by thousands of teams including sports teams,classrooms, churches, boy scouts, and many other groups. Teamadmins like sports team managers, teachers or coaches now have aconsolidated mobile dashboard with all their team information righton their finger tips. The mobile-first design of InstaTeam allowsmost of the team management functions to be done right on themobile app without the need to using desktop. With a simple andintuitive user interface and built-in automation, team admins savelots of time when creating team schedules, managing team rosters,and sending team members notifications. What makes InstaTeamdifferent from other sports teams management apps like TeamSnap orTeam app? InstaTeam is more than a sports team scheduler oractivities manager; it allows real-time messaging between teammembers, coaches, parents and others while maintaining privacy.Coaches can not only send instant messages for important updatessuch as cancellations or venue changes, but also can monitors thestatus as to which team members have viewed or responded to theirmessages. It consolidates all team management functions into onesimple app. • Team Roster: Easily Import and export team membersfrom excel file or copy team members between teams. • Simple signupwith single signon integration with Google and Facebook. No need tocreate a new account and password • Events Management: Createmultiple events on multiple days or edit events in bulk with justfew clicks. Create games, practices, meetings and other events forall your teams in one shot eliminating duplicate work. •Communication via instant messaging, team messages or team surveys• Schedule Integration: Import events from an excel file or useiCal link from external calendars to subscribe. Export team eventsin multiple formats such as excel, iCal, web url or integratedirectly with Google calendar. • Carpool: Offer a ride or ask aride to an event. Easily check who needs a ride and who is driving.Coaches can add team transportation and assign team players •Signup Items: Create volunteer spots, parent teacher associationsignup sheet or just simple signup tasks for an event. • TrackItems: Assign tasks or items to team members with due date. Findout who need to return team equipment, submit registration ormedical forms, etc, Set renewal date for forms. • Notificationflags when a payment is due or a track item task is not completed.• Payments & Dues: Receive payment from team members usingStripe and keep track of who paid when and how. Coaches or teamadmins can easily view which members have not paid their dues •Attendance and player availability: Team members or parents can settheir availability for upcoming events. Coaches can mark memberattendance as present or absent for the events. • Privacy: Unlikeother team management apps, InstaTeam gives full control to teammember to keep their information private and still be able tocommunicate with other team members. • Team Fans and followers:Sports teams can promote their teams by getting fans within localcommunity as team supporters. The fans can view all games scheduleand be there to support the team. • Event Reminders: Allnotifications are sent via to the mobile phone as well as viaemail. There are many other features such as Live Coverage, livescore reporting, photo sharing which makes InstaTeam the mostdesirable app for team members , coaches and team parents.InstaTeam is a MUST-HAVE for busy parents with one or more kids onmultiple sports teams. It instantly informs parents of anylast-minute changes in team practices and games, including venuelocation. Parents can now coordinate with other parents to shareride, carpool, or assigning refreshments. Download InstaTeam todayand experience the most comprehensive app which consolidates allthe team information for coaches, players and parents. Strategic Management app is a reading material about timemanagement, strategic management and decision making. A very usefuland handy app to potential leaders and user who want to gain moreknowledge about strategic management. In this Strategic Managementapp, user can find several topics related to management as below:-1) Time management - The twenty biggest time wasters - Reason fortime management - The time management matrix - Time savers -Guidelines to successful time management 2) Strategic managementand decision making - Evolution of management thought - Basicmanagement - Strategic management - Strategic management construct- Strategic manegement framework - Strategic management cycle - Thefocused organization - The strategy changed cycle 3) ManagementQuotes Download Strategic Management app now for FREE. Happyreading! What's the difference between leadership and management? The maindifference between leaders and managers is that leaders have peoplefollow them while managers have people who work for them. Asuccessful business owner needs to be both a strong leader andmanager to get their team on board to follow them towards theirvision of success. "Management is a set of processes that keep anorganisation functioning. They make it work today – they make ithit this quarter's numbers. The processes are about planning,budgeting, staffing, clarifying jobs, measuring performance, andproblem-solving when results did not go to plan." Leadership isvery different. "It is about aligning people to the vision, thatmeans buy-in and communication, motivation and inspiration." Thisapp contains articles about leadership and management. Download forFREE now! DISCLAIMER : Content like Articles, Pictures and Video inthis application were collected from all over the web, so if I haveviolated your copyright, please let me know and it will be removedas soon as possible. All copyrights and trademarks are owned bytheir respective owners. This app is not endorsed by or affiliatedwith any other affiliated entities. All images used in this app arebelieved to be in public domain. If you own rights to any of theimages, and do not wish them to appear here, please contact us andthey will be removed. Ideal for business owners who sell occasionally at fairs, markets,and pop-up shops. Easily sell your products and accept paymentsanywhere right from your Android device. Use it with any Shopifyplan. No matter where the sale happens, your orders, inventory, andcustomers are automatically updated on your Shopify store. WHYCHOOSE SHOPIFY POS: • Start selling as soon as you download the app• Securely accept cash and credit • Attract more business byoffering discounts • Email and text receipts directly to yourcustomer • Sync products with your online store and other saleschannels • Create new products and add product photos right fromyour camera or gallery • Set up sales taxes based on locationautomatically • Issue refunds on the spot • Accept customizedpurchases without affecting your existing inventory STAY ORGANIZED• View your online and physical store inventory all in one place •Get a warning when products are out of stock so you can plan ahead• Track customer orders and sales made on external terminals • Addcustomized notes and attach customer details to orders KEEPPAYMENTS SIMPLE • Securely accept cash and credit cards no matterwhere you are in the US. Our free card reader can be used withShopify Payments. • Process all credit cards at the same rate, withno hidden fees, for as low as 2.4% + 0¢ with Shopify Payments LOGINTO SHOPIFY.COM TO: • Sell online, in person, and on your favoritesocial channels in minutes • Manage your orders, products, andcustomers in one place • View sales, reports, and analytics aboutyour business • Choose from hundreds of apps to help withmarketing, shipping, accounting, and more LANGUAGES English,Spanish QUESTIONS/FEEDBACK? Call us at 1-888-678-9481 for 24/7support. You can also contact us at Shopify Support(https://support.shopify.com/), or visit the Shopify Help Center(https://help.shopify.com/manual/sell-in-person/mobile).